On July 18, 2013 a two-year old girl was attacked by none-other than a coyote at a cemetery in California. Klarissa Barrera was injured and had a 2 and a half inch gash on her calf after being attacked by a coyote in a cemetery in Orange County, CA while visiting the grave of a relative. The attack occured in broad daylight at 4 p.m. according the California fish and wildlife authorities and happened at Forest Lawn Memorial Park in Cypress, California. Klarissa was given a pre-cautionary rabies shot after the attack but was in good shape. Klarissa’s mother pulled her from the coyote during the attack to prevent further injury to the young girl. 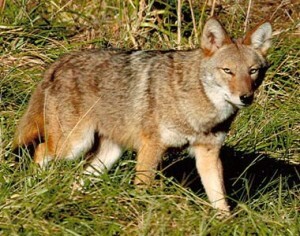 California Fish and Wildlife personnel have told the public that these attacks are few and far between, but they still went out and shot three coyotes near the cemetery. The coyotes near the cemetery are apparently becoming too close with humans and aren’t fearing that interaction as much. Just another reason to hunt coyotes this year….